Over thirty nine government officials and representatives from civil society organizations, who are engaged in long-term recovery, participated in the discussions on recovery planning organized by the Government of Pakistan, UNISDR, and UNDP with IRP contributing the key resource persons. The three-day event was held at Hotel Best Western, Islamabad, Pakistan from 28-30 November 2011. The discussions facilitated the sharing of knowledge and experience on recovery planning with the intention to further enhance capacities and enrich the recovery planning process before and after large scale disaster. Additionally, the discussions were organized to provide an avenue for participants to discuss different recovery issues and reflect on wide array of options and examples from global experiences. Towards the end of the event, recommendations drawn from the group discussions were fine-tuned through comments from other participants and experts from IRP member organizations. As way forward, NDMA Pakistan, UNDP, and UNISDR are exploring the best way to forward this type of learning event down to the district and village levels. NDMA, in partnership with other development organizations, can serve as focal for dissemination of training on recovery planning at national and local governments as well as other relevant organizations. IRP welcomes opportunity to assist NDMA in this endeavor. 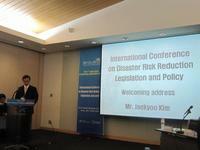 From 22 to 25 November 2011, Asian Disaster Reduction Center (ADRC) participated in a UN international conference on space-based technologies for disaster risk management, "Best Practices for Risk Reduction and Rapid Response Mapping" in Beijing, China. The conference, organized by UN Office for Outer Space Affairs (ONOOSA) and the Ministry of Civil Affairs of China, was attended by more than 100 experts from space agencies, academia and NGOs. ADRC made a presentation titled "Activities of ADRC in the Sentinel Asia, and the effectiveness of satellite images on the Great East Japan Earthquake" and introduced its activities of emergency satellite observation in collaboration with Asian countries including the response to the Great East Earthquake. 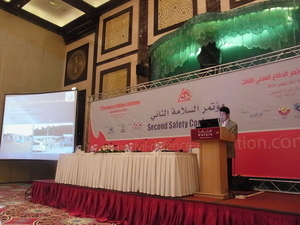 2nd Safety Conference, Qatar Vision 2030 "Century Challenges"
The 3rd Civil Defence Exhibition and Conference was organized by the Government of Qatar from 14 to 16 November 2011 in Doha Qatar. As a side event, the 2nd Security Conference (forum) was held. Seven officials and specialists on Disaster Risk Management, including a ADRC's researcher, were invited to the forum to deliver presentations/speeches. The ADRC explained the damages of and lessons learned from the Great East Japan Earthquake and Tsunami in March this year while other speakers presented a broad range of issues, both man-made and natural disasters, such as climate change, challenges concerning high-rise building disaster and information dissemination. More than 200 officials, experts and the media people from Qatar participated in he forum and actively exchanged views and opinions among them, demonstrating their strong interests in disaster risk management.